Find a Discovery trip that explores Banff National Park. There are 111 tours to choose from, that range in length from 5 days up to 211 days. The most popular month for these tours is July, which has the most tour departures. 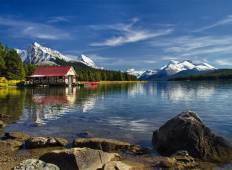 "Canadian Rockies tour from 25th September. Excellent tour guide, driver, sights,..."
"Jaspar was a very knowledgeable guide. He made sure we were all enjoying the tour..."
"great tour and a very nice experience. All the best of the rockies in 10 days. some..."
"My trip to the Canadian Rockies with Trafalgar was beyond my expectations. The sights..."